You know that tempting sandwich combination from Panera Bread? Well, I’m making it a bit healthier using sprouted grain bread, extra virgin olive oil and clean eating, Simple Cranberry Sauce. 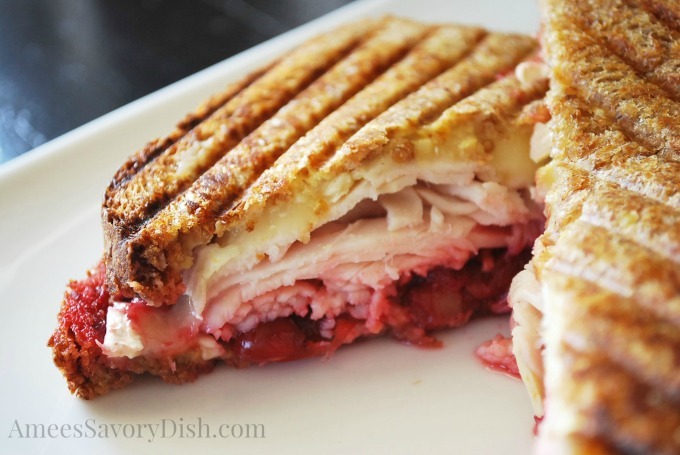 This Sprouted Grain Turkey, Cranberry & Brie Panini is a great meal to use up those delicious leftovers from Thanksgiving. Check out all of the other great ideas for utilizing Thanksgiving leftovers from my Sunday Supper friends below! Have a Happy Thanksgiving everyone! Gobble. Gobble. What a terrific sandwich! As a huge fan of brie, this looks totally irresistible! Thank you Liz! I’m a brie lover, too! What a truly sweet and savory sandwich! Yum! Love a great grain bread like that but you did me in with the brie, my fav!! The Brie just takes this over the top! Now you have me craving it! This panini looks great! I’d like one for lunch, please. SImple and delicious! I love a good Thanksgiving sandwich! Mmmmm, this looks so good. 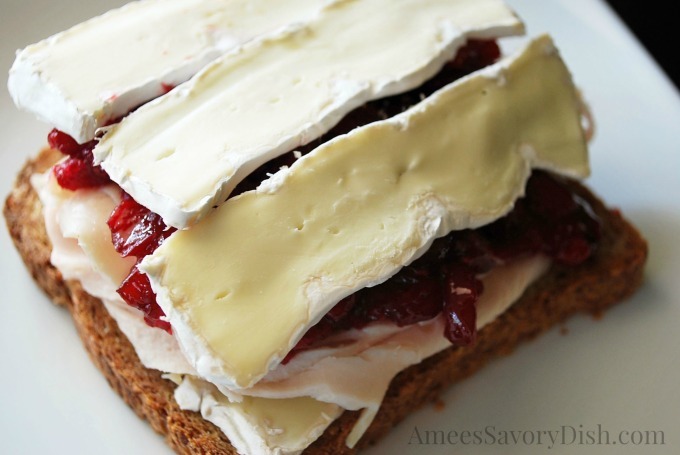 I love the mix of the brie with the sweet and tangy cranberry sauce and spicy mustard! I have a panini maker and I use it a lot. I can’t wait to try your recipe! Thank you Lisa! Happy Thanksgiving! Oh Amee! You had me at brie girl!! Oh yum! I love Panera’s version, but just know this homemade, healthier take on it! Cranberry and brie may be one of my favorite sandwich combos in the world. I LOVE that picture of the cheese slabs just sitting on there waiting to be melted! Happy happy holidays! I have leftover brie and I’ll have the rest tomorrow so its yes to these yummy sammies! Oh I might die for one of these – look at that cheese!! Love it!